Managing any social media community can often be a challenge, especially when you are doing so on the international scene. A lot of brands are able to build up followings and communities over time, and a lot of brands traditionally start off in a single country. The Toronto Wolfpack however have not had that “luxury” period, being the first ever professional trans-Atlantic sports team, they are international from birth. Cultivating and managing a global social media community (predominantly in Canada and England) is no mean feat. Especially when the brand harboured such a negative reaction from large sections of the Rugby League community from the off. A lot of the negative reactions I believe are down to the differences between American/Canadian and British sporting culture. In Britain we have a long-established league system of promotions and relegations amongst nearly all of our sports, while across the Atlantic a lot of the major sports leagues are made up of “franchise teams”, and leagues expand to accommodate new franchises. Franchises can also move to new geographic locations (the most recent case in point being the St Louis Rams moving to Los Angeles). This “relocation” of a team was attempted in England, with some objective levels of success, when Wimbledon FC moved to Milton Keynes, becoming the MK Dons. At this moment in time, the Toronto Wolfpack have just broken the 11,000 follower mark on Twitter, and 12,850 likes on Facebook, which for a team that is yet to play a competitive fixture is a remarkable achievement (set to play their first competitive match on March 4th 2017). In fact, they currently have the 16th largest Twitter following out of all the clubs in the top 3 leagues of the Rugby League system. Aside from Leeds Rhino’s Twitter following, outside of Super League there are few teams breaking through the 10,000 follower mark. These followers aren’t just bystanders either, they are engaging as well. In January 2017 their 358 tweets gained 1,344,472 impressions and 73,746 engagements, which is an engagement rate of around 5.5%. This includes 36,000 media views/engagements. Fan engagement has been a major factor in building the Toronto brand. So what can we learn from this unique situation? 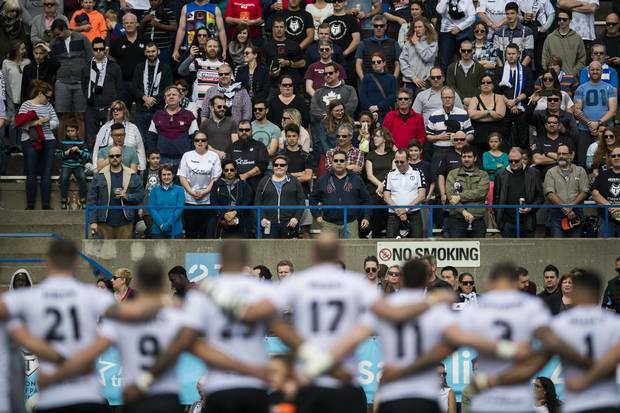 I’ve spoken with a key member of the Toronto Wolfpack social media team about the challenges that they have faced so far, and where they see the brand developing on social media in the future. It was announced in May 2015 that a Toronto based rugby league side would be entering the English league systems, the response to this was ‘mixed’ at best. How have you found the negative comments being made through social media and what has been your strategy to deal with them? It was definitely a bit shocking at first to see the level of vitriol and hatred that was harboured by many towards this project. It was mainly from those in the ‘heartland’ of Rugby League, the M62 Corridor/Northern England, and a litany of Leigh Centurions fans who didn’t have the greatest things to say about our Head Coach Paul Rowley and his and a number of their former players choice to take their talents to Canada and join the Wolfpack. I found it hard initially to detach myself personally on an emotional level. I am passionate about the club and am friends with a number of people within the organization who were being targeted. I had to make a conscious effort to approach the ‘haters’ in a manner that begot a Pro sports franchise, but I also felt it was important to solidify our support base by engaging fans constantly so it was and remains a challenging aspect of the job. Initially I was forced to block a few select people that had somehow obtained confidential information regarding new player signings and were constantly updating before we released the news. They were really accurate too! Haha. I laugh at it now but at the time it got to me. I now try my hardest not to block anyone unless they are saying super hateful stuff or really crossing the line somehow. My ethos towards the cynics and naysayers is to “kill them with kindness”. I actually take time to direct message people and pick their brain about what it is that irks them. I have used this approach with Rugby League fans who just cannot stand the idea of our club and falsely proclaim the Rugby Football League is propping us up, I use it with Union fans who are decrying rugby league, and I publicly address the negativity with a calm and professional manner, and be as nice as possible without coming off cheeky or condescending. Great question though because it is definitely one of the more difficult aspects of the position, and caught me off guard, initially. It should be noted, though, that the love, praise, and welcoming sentiments have far outnumbered the hate and negativity, and it is that positive element that helps keep things in perspective and helps you take the negative comments with a grain of salt. Given the time difference and the slight differences in our use of the English language (phrases etc) how have you found dealing with growing the brand on social media both in Canada and in the UK? Honestly I have been obsessed with multiple facets of English culture throughout my life, and at one time lived outside of Birmingham, working with our CEO Eric Perez for his advertising firm. My father and grandfather are British as well. I picked up on some of the dialectical differences through my family and through my experience travelling to and living in the UK so I do feel it came somewhat naturally for me. I use scheduled publishing to ensure that our posts are timely for both audiences. I do find that if I am posting by 8am EST, that makes it 1pm GMT which is generally a peak activity time for social media, so it actually works out quite well. It can be a little more intense if there is a game, like the Hull friendly, which started at 9am EST, and meant that for the 2-4 hours preceding the match there was a flurry of traffic on our social platforms that could be leveraged via engaging with and posting to those fans. So I try and make sure I plan for those days in which there are key events, signings etc., and that I consider the time difference when doing so. When the 2017 season gets underway, how are you planning on developing the Wolfpack’s social media? We really have been focusing on the visual direction/branding of the entire operation since I came on board, as I felt that was the area where we had the most room for improvement. Our logo was awesome so that made it a bit easier, but there were a litany of aesthetic adjustments that I felt were necessary to ensure that we had a unique and identifiable ‘feel’ to all of our branding and graphic work. I think we will continue to ensure our content is always of the highest quality, which is half the battle, and then focus on keeping a cohesive and somewhat rigid protocol to keep our visual identity congruent throughout. We have found that contests, polls, video’s and articles/blog posts are some of our highest impression/reach/engagement pieces so we will continue to work on those types of posts to keep the buzz going. Once the season is live, Instagram Story and Facebook Live are going to start being integrated more frequently into our social media strategy, especially when we begin our block of home games in Canada. Disclaimer: All images have been shared with me by the Toronto Wolfpack, with their permission for them to be used in this article. All data used has been provided by the Wolfpack with their consent.